I love celebrations with little kids around. Every thing is such a big! deal! 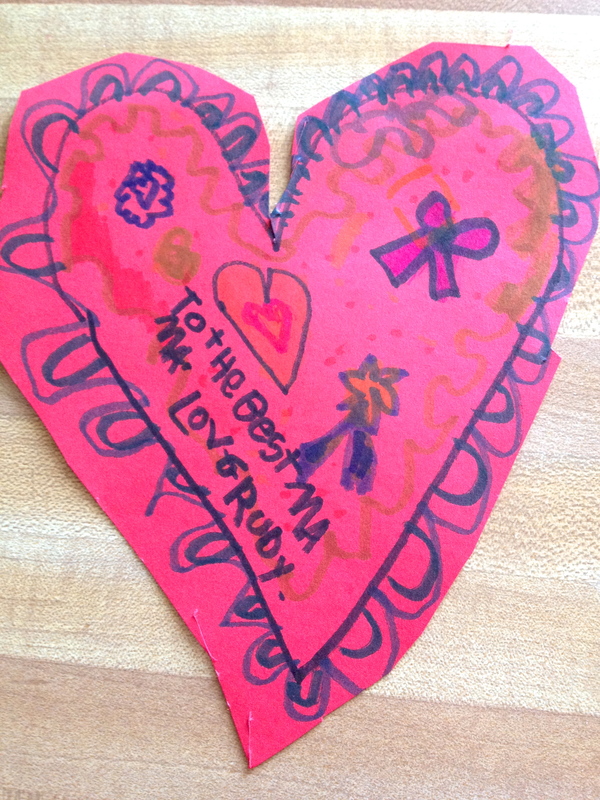 We hosted a little Valentine making party for some of Ruby’s friends the weekend before the big day. There was paint and glitter all over our table, surrounded by very focused little girls. 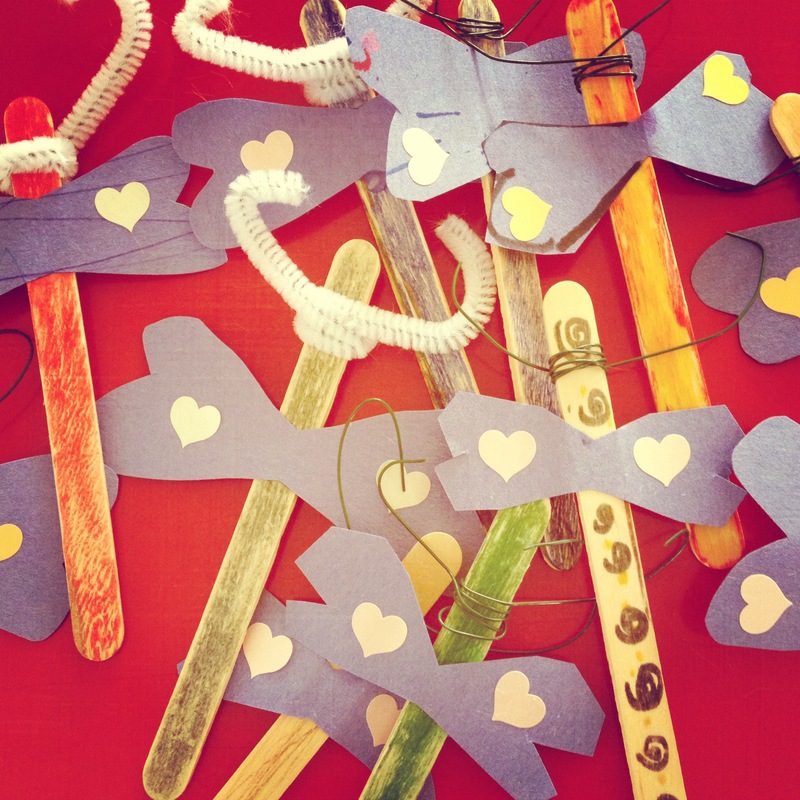 We made salt dough hearts that some of the kids painted and glittered for their Valentines. We made a bunch of these years ago that we hang as a garland each February. 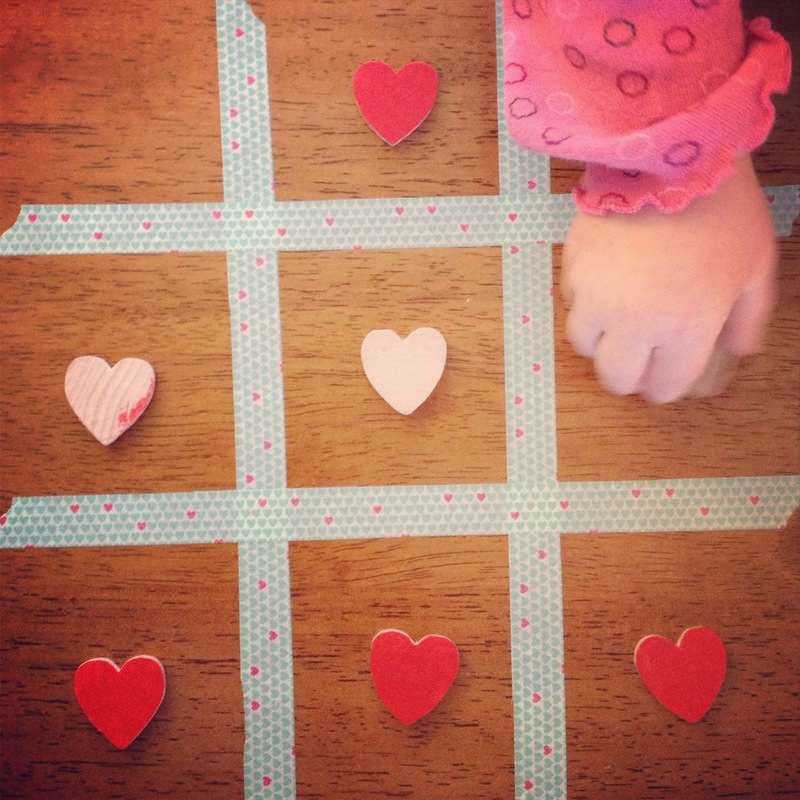 We had a little heart tic-tac-toe game out for girls to play when they needed a break. 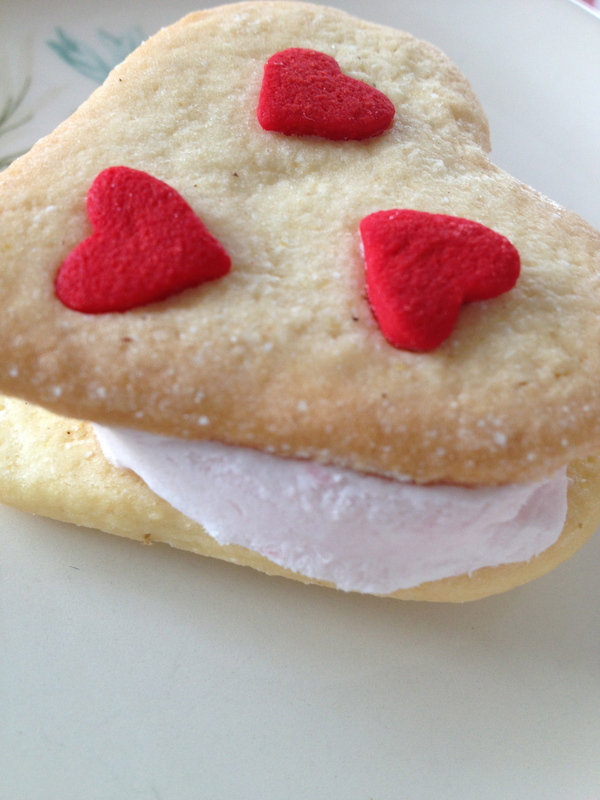 And some strawberry ice cream sandwiches to munch on. I made Gigi stuffed kitty. John got a sleeve to the sweater I’m knitting him and special pencils. He gave me two boxes of cookies from a favorite far-away bakery – so thoughtful and delicious! 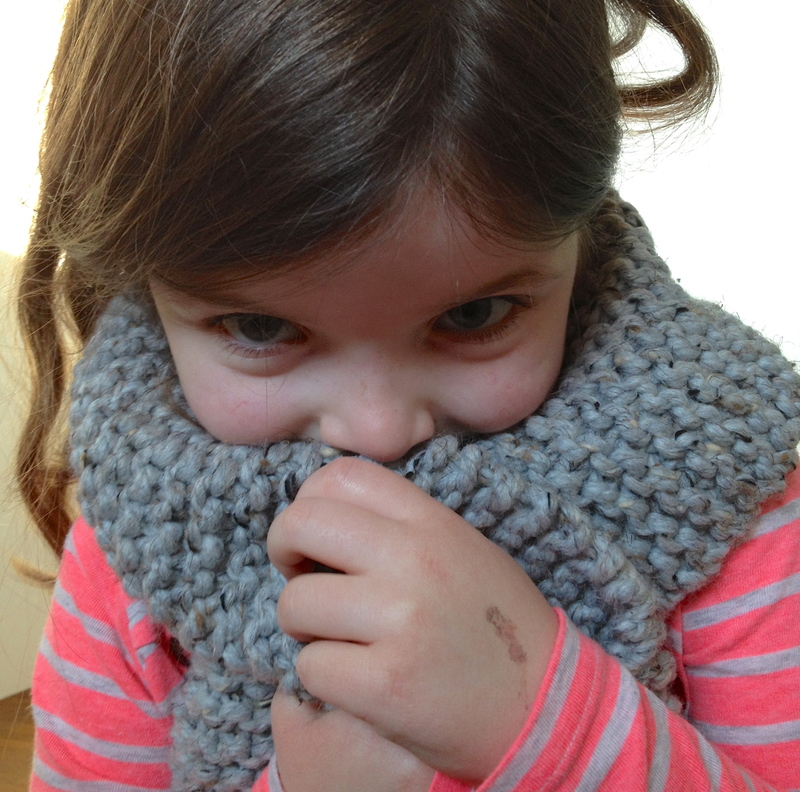 I knit Ruby a scarf to keep her warm and “snuggled with my love” as she said (heart melts). But the best part, by far, were the sweet little notes we all got from each other. I can’t seem to get enough knitting lately. This week Ruby went to her twin friends’ birthday party and wanted to sew them some stuffed animals, so she and I sewed a bit, and I loved how quickly that came together. I thought I’d share some sites I like for craft supplies and hope you will too! Layer Cake Shop has everything for a cute kids party: pretty cupcake liners, fun ice cream spoons, and a favorite in our house: paper straws. I’m always inspired flipping through a Paper Source catalog. They have gorgeous papers, stationery, and DIY ideas. I love that Magpie Patterns has sourced beautiful patterns for knitting, sewing, and embroidery in one place. They sell Brooklyn Tweed, Oliver + S and more. Fabricworm has tons of beautiful fabrics. Searching their site and visiting Bolt always make me want to learn to sew better. Brooklyn General and Purl Soho have fabric, yarn, patterns, and all the tools you’ll need to craft. It’s a relief to be able to get everything in one package! This month is always such a strange one for me. After all the busyness of the holidays and making, I just want to curl up with some hot tea and knit. I get a little cabin fever with the dark, cold, wet days too. But I also feel the pull to organize, resolve, and energize my life. These opposite energies are challenging to balance. We have sunshine today and I find myself following it around like a cat. I stand in a sunny window and soak it in. My oldest (well, not her age, just how long we’ve been friends) friend and I were inspired by Sarah and are sharing bits and pieces of our lives together via texts. I am treasuring this connection with my cross-country friend and the reminders to take notice and appreciate more in my own life. 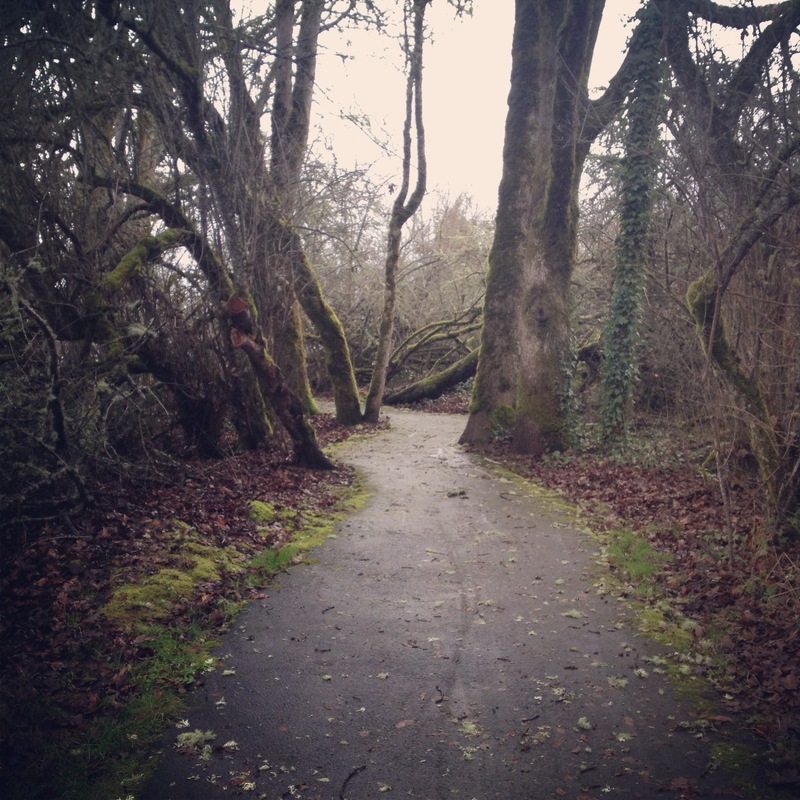 I love walking through this little path in the woods near our house. It’s in a neighborhood, but it is hilly and full of birds. I can get there quickly and lose myself in the mossiness of it all. There is the constant lure of these needles and the calming simple stitches on them. About a week ago I started this sleeve for John’s sweater and am now about half-way done. This is good progress for me who only finds little bits of time to sneak in some knitting. 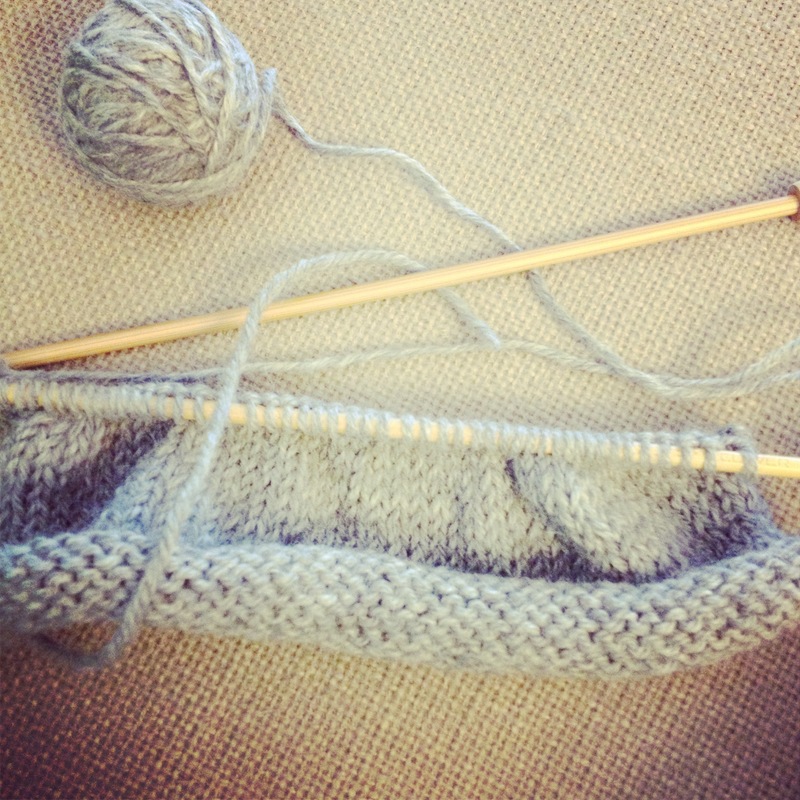 There are talks with a friend to knit together and I cannot wait to make some real progress. So far, I think we’re making January pretty cozy. I bought the R wall hanging there from Bellybaloo, and she gave Ginger the G. They match so nicely and will look adorable hanging in the girls’ room, don’t you think? I managed to finish knitting this sweet little sweater for a new baby friend. 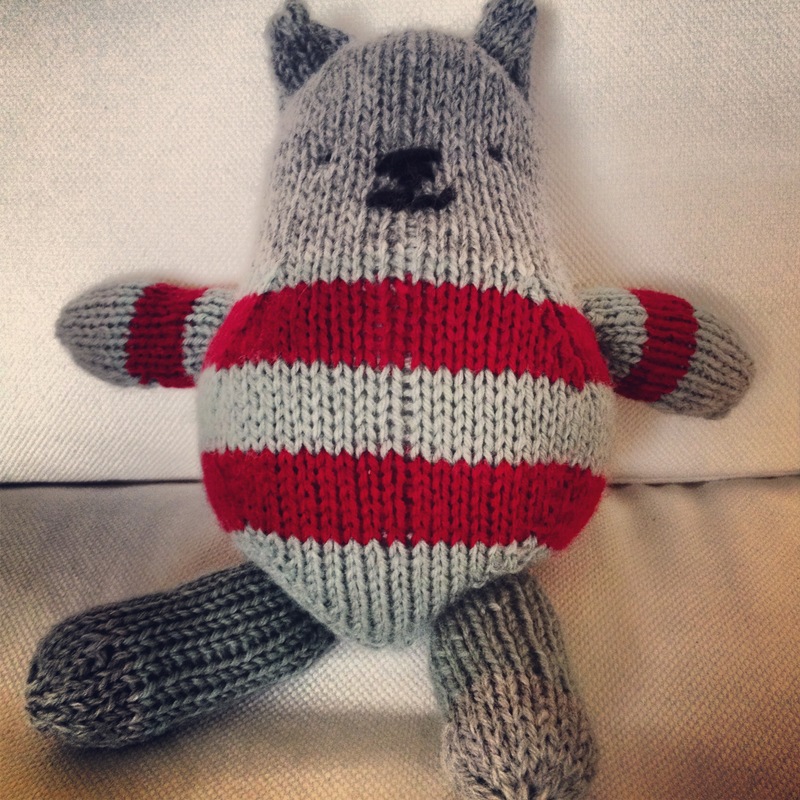 The pattern is from Knit Knack Kit, which I love. The sweater turned out pretty cute and was pretty simple to make too. I’ve finally managed to get some photos of Ruby’s 3rd birthday up in flickr (only 2 1/2 months later) in case you have been wanting to see them! Ginger is already a month old! She is so snuggly, I can’t stand it. I spend most of my days holding her, and breathing in her lovely baby smell. I made this sweater (details on Ravelry) for Ginger many months ago. It is almost as soft as she is. My family came in shifts starting right before Ginger was born through the time she was about 3 weeks old. John has a flexible schedule at work, so he took some time off again after family left to help me transition to being alone with both of the girls. But right after our family left, we had to take everything out of Ruby’s room for several days to have a crack in her plaster ceiling repaired. Ruby was “sleeping” in our room, along with Ginger, which made sleep for all of us a little tricky. Then our dryer broke (with 2 loads of wet laundry waiting for it). So things were a little stressful the past week and a half. All is well now and thank goodness we have two easy-going kids or we wouldn’t have survived. Now we’re gearing up for Ruby’s 3rd birthday! P.S. We have several new babies to welcome and congratulate: Amara (born on the same day as Ginger to my friend, AS), our new nephew, Wyatt, and Rowan, born yesterday! All happy and healthy. Good luck to all our baby friends on the way! Thanks for all the emails, comments, and phone calls about our health. We are all well again and enjoying being able to visit with friends and leave the house…and breathe without coughing. There’s been a lot of crafting going on here in preparation for the baby, but I’m planning on sharing pictures of everything when we have a cute baby to model for me. I did manage to make a couple things for John and Ruby’s valentines gifts though. I made John this hat (details on Ravelry). It was pretty easy to make, even though I had to adjust the pattern quite a bit for his gigantic head (which he better not pass on to this baby that I have to push out). Gotta love this funny face. I made this heart for Ruby from Handmade Home, the book I wrote about here. It was also really easy to make. I used linen fabric from an old dress of mine that I don’t think will ever fit again and made the pocket from a sweater that was accidentally felted. I stuffed it with some dried lavender from our garden, as the pattern suggests, which is a lovely detail. We put a note in the pocket from Ruby and she loves to snuggle with the pillow when she sleeps. I hope it will be a tangible reminder of our love for her that she can hold on to when we’re apart (when I’m at the hospital, or to stuff in her backpack when she goes to school). Happy Winter! We are having a gorgeous, cool, sunny day here, which we are soaking up. I am so thankful that our days will be getting longer, bit by bit and for our week-long forecast of sun. We’re finishing up the last details for Christmas and Ruby is so excited this year (although she is all business here on Santa’s lap)! There is a horse-drawn carriage that rides around our neighborhood on the weekends before Christmas. It goes right past our house and we can hear the jingle bells and carolers. Ruby was really excited when she heard it last weekend, especially when we suggested it might be Santa and his reindeer doing a little test-run. Have you seen this video you can personalize from Santa? I found it on Alpha-Mom and Ruby loved it. 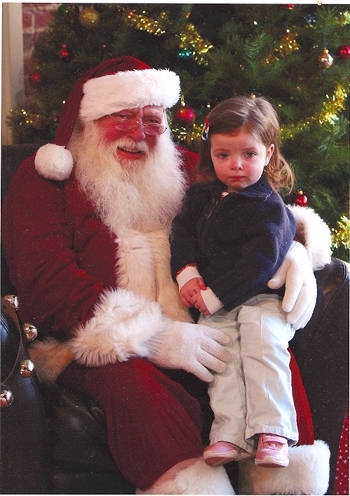 She keeps asking to iChat with Santa again. I made Ruby a little case for some new markers that she’ll get on Christmas. I used a pattern in The Creative Family by Amanda Blake Soule (a book and blog I love) and one that my mom made for crayons for Ruby for inspiration. I was knitting a sweater for the baby one day and Ruby asked what I was doing. When I told her it was for the baby, she remembered the hat I knit for the baby too and said, “What make for Ruby?” I reminded her of the things I knit for her while I was pregnant with her and told her I made something that she’ll get at Christmas too. She was pretty excited about that. We’ll see if this lives up to her expectations. Ha! Welcome to my little corner of the world. 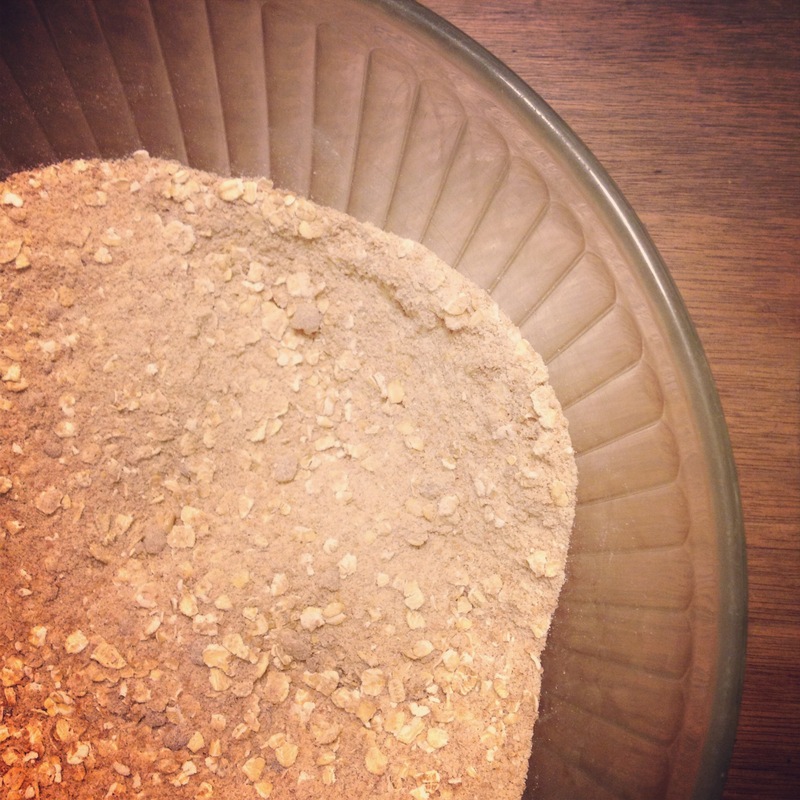 I am a mama to two little girls, a soap maker, a baker, and crafter. 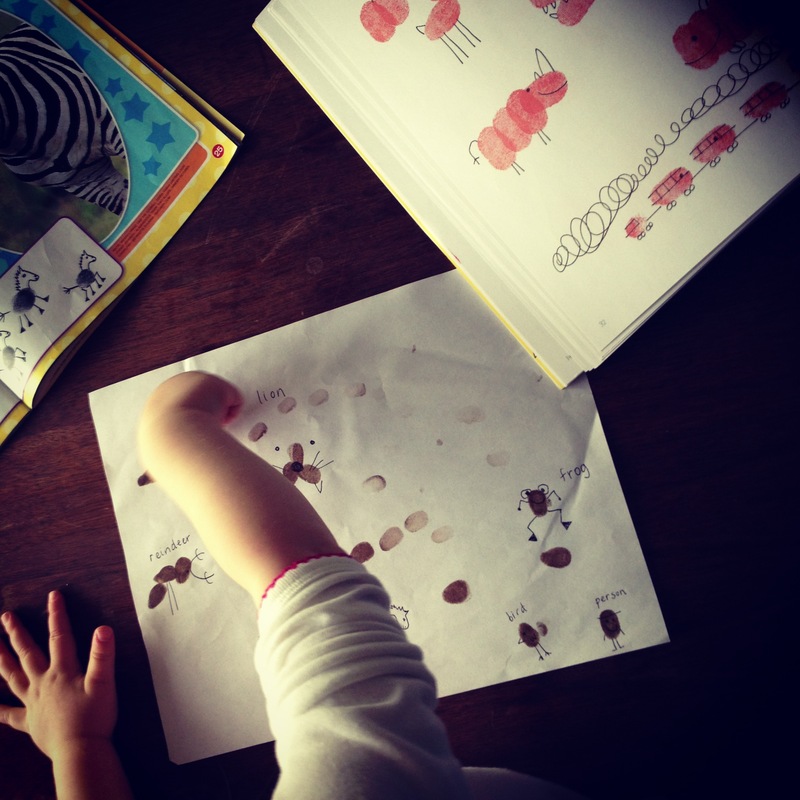 I spend my days reading with my girls, practicing yoga and dodging raindrops.